in collaboration with the UNO: '2001, the year of dialogue between cultures'. four typefaces from kame are chosen into a selection of 100 typefaces worldwide, from 14 alphabet cultures. kame's two japanese designs are the only kanji typefaces represented. and inclusion in the book in preparation by graphis press. "black and white" east / west. a japanese and latin typeface pair, already awarded with two prizes at the 1999 morisawa contest. kame's most popular typeface keeps finding many great uses. more perfect than the romans. 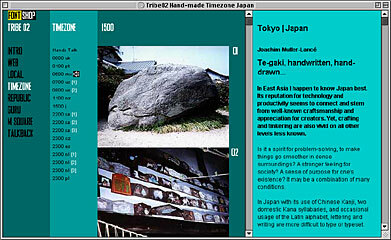 just published its second issue: "handmade". kame reported from japan again.